All parents are interested in enjoyable children-friendly activities and ways to introduce youngsters into math for developing and understanding the concept and use of money. Children are known to learn quickly and properly when the needed learning is introduced via play because play is an enjoyable and easier way to learn and to remember. 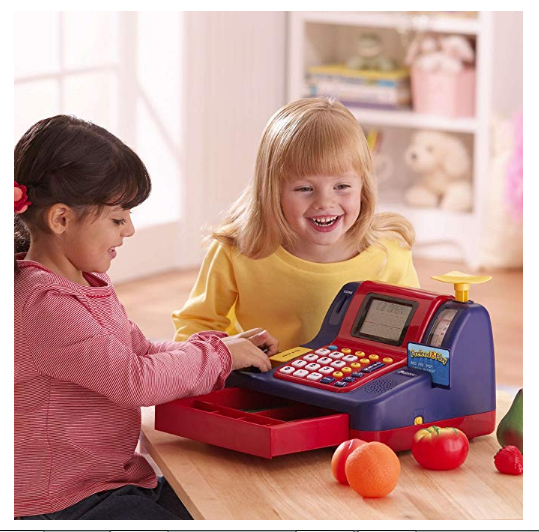 This cash register toy introduces children to role-playing creatively using money via four very well thought through featured designs which ensure learning can be achieved through playing. The auditory built-in features further serve to ensure that a child can understand how to use math in conjunction with money as a purchasing tool. This is an incredibly innovative toy which is based on the future realities of purchasing power in commerce and arithmetic for children. Every child has to master these future everyday skills and this product has been carefully thought through and put together for near-realistic shopping for acquiring the understanding and skills needed for using money. This role-playing toy enables children to grasp the concept of using real money or using credit cards and coupons, for loose change purchasing this also includes realistic copies of coins. Children can scan an item and hear the price, slots for money will be voice activated to name the money which is dropped into the slot. That’s just a taste of what this great learning toy offers. 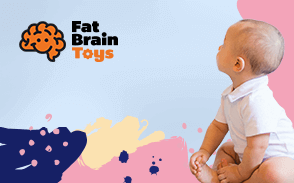 Here we have hopefully whetted your appetite to know more about the features, functions and positive developmental learning outcomes which children can gain from this product. Read on on and enjoy the full breakdown for what this toy offers for children. This toy has all the features and best use of materials used in creating those features to easily qualify as an exceptionally good child skills development pay set. Featuring a total of seventy three pieces which means children are very well provided for with a good range of learning activities all of which interact together and compliment learning while ensuring fun. The functions in this toy enable children to hear differences and see differences which directly relate to purchasing power through money, coupons and credit cards. The fun activities offered via this toy combine money and math and therefore children will develop these vital skills during play. The learning enjoyment factor is further cranked-up through the designed in choice of sounds, lights which react to the activities being used and the helpful voice messages which play throughout financial game activities. The materials provided are designed to look like money and near to life-size, the credit cards are convincing in size and design, coupons will probably need to be explained by parents so children understand what they are and how they work. A nice feature to use with this cash register are the scales for weighting products such as fresh fruit and all types of vegetables, the learning potential here for children speaks volumes, they weigh up and they buy. They know what they have to pay and exactly why. If they weight up a big load of fruit this will cost more, this is a very good way to introduce this perception for young shoppers. When seeing materials built into features representing money and looking very close to the real deal, this means children pull in the skills required to identify the different values and types of money. The materials used in combination with great design bring home the realities of money for younger children. An impressive selection of functions and these functions interact with other functions to ensure that children are grasping money values, methods for payments. The functions include coin slots which take the toy coins or real money, pop in the toy, hear the clunk which is a sound to fascinate children when they hear the built in voice system announce the insertion of a coin. 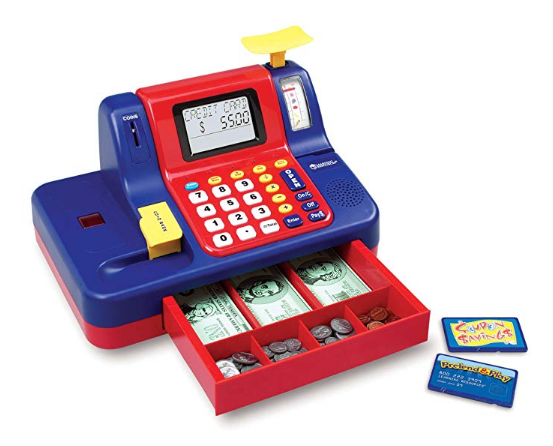 The cash-register toy has a designed in scales for weighing products, wave or pass a product over the sensor and children will hear a price which they must either charge or pay because they can role play being a shop keeper and a customer, this will be a lot of fun for imaginative children. They can use coins to pay and this function prompts children to use numbers in relation to paying money and giving out change. The same applies if they use the tot money notes and they will pick-up that using money notes gives more spending power when doing the shopping. 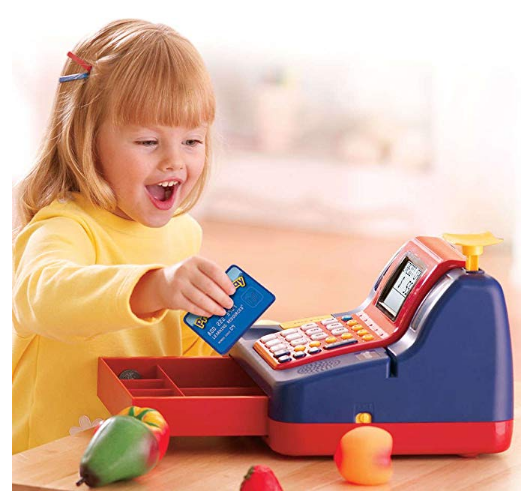 Figuring out how to use credit cards will be fun for children, it is an easy method for shopping and they will learn the procedures used for shopping with a card. They will need to develop math even further when they use a coupon or several coupons to shop for what they need. For functions blended with learning about money and spending capability this cash machine has functions which fully engage children, they need to think, they need to remember, they must use math. Given seventy three pieces to work with in this toy-set this means a great array of functional interaction for children all of which focus on role-playing that which in the future they will need to do in a real shop, therefore it is justifiable to point out that this toy takes children through very constructive development stages. That the designers of this toy have so much innovation built in through so many positive learning functions all of them qualifying as playing means this is a highly functional product. Children will not get bored, there are four developmental levels for playing and learning about shopping. Real cash registers are and must be durable, the makers have taken this into account and factored in how robust children can play, especially when having fun. Weighing in at five pounds in weight this is a solid toy and selectively built to be operational and durable. The cash keys can literally last through lots of ringing up by eager fingers on this cash machine and they will stay operational so long as the toy is used in the context for which it has been created. The imitation money is very durable, the paper money is not of the type of materials which can rip easily, it is made to withstand a lot of handling by happy children while they are playing and enjoying shopping. Plastic coins are sure to be durable, in fact damaging them would be difficult. The scale set is robust and solid in design and the battery powered functions are built out of harms way inside this toy so that they are less susceptible to damage. For an educational toy which is certain to receive lots of constant use this product offers a very good level of durability. The range of materials used in the construction of this toy do vary and from plastics, imitation money, minor metal internals for electrical functions, safety has been applied in the design and construction process. As this weighs five pounds it is smart to place it on a stable flat surface so that is cannot fall down and land on unsuspecting vulnerable feet or toes. It is apparent that an appropriate amount of prior research has been given to the design and use of this toy and the safety factors are very good. There is no evidence of any chemicals or other inclusive elements in the overall construction which can present a safety threat to children playing in context. Designed to a size of thirteen inches long, just over nine inches in width and a lofty eight inches high, this is a lifelike scale in dimensions for small children, yet of a size which makes it easy to set up at any safe or stable location. Excellent designing to ensure safety, ease of use, functionality and a realistic copy of a standard shop cash register which has functionality for purpose included into the design. The paper cash and rigid plastic coins are designed to look close but not exactly like the real thing. Four levels of shopping play which subtly brings in the skills for addition, subtracting numbers, weighing products, invoking sounds are designed into this toy to give it a strong playful interactive quality. This design allows a child to role play himself/herself as both shop keeper and eager customer, or children can play in pairs or groups, all design features allow for lots of positive interaction and a gentle and positive set of learning curves. Top marks when it comes to the ease of use for children, children can scan an item through waving it over the scales, make sure the kids have different sized fruits and vegetables so they can be busy and enjoy their shopping. The denominations designed onto the coins and paper cash money are clearly shown and easy to follow, so while shopping, children can easily practice addition and deducting amounts through numbers related to spending money. The voice messages are automatic which means real ease of use and while supporting children's understanding for the shopping process and of course keeping children positively engaged. Watch the reactions from kids when they pass some item over the scanner and a voice tells them the price, this is interaction at a great level. The ease of use is so child friendly that parents can let them explore and master the ranges of functions and they will soon get the idea and start lots of creative shopping games. Over-worked cash registers can become scrambled and if this happens just hit the reset button to quickly re calibrate this impressive toy. It is close to perfect for portability within the design for context, children can carry this cash-register, set it up on a table, the floor or a cabinet surface. From 5 years and up the weight is comfortable for children and they will be safely in control when they move it to where they want to play. For development of logical skills this product is on the mark and steers children towards an abundance of logical skills, all of which are very important when it comes down to spending money or being given the correct change from a purchase. They will learn to accurately identify that different forms of paper money and coins do have different levels of value. They will figure out that credit cards have a very wide value range when used to buy products and that they should be encouraged recall how much they spent via the card. Weighing up products can be a challenge especially for kids and this gift will put children on the right path towards these logical skills, if it weighs a lot it will cost more and if it weighs a little it will bring down the cost. Logical communication will be worked on through constant role plays between children while they imagine they are out shopping and spending in much the same way that they have seen Dad and Mom do. The makers suggest an age from 5 years up and it is easy to understand why, because children under 5 years might be inclined to put plastic coins in the mouth and this would present a risk. However, under very caring supervision, some parents have stated they used this innovative child's toy to introduce them to selective functions. A parent playing with a younger child and helping them learn to identify paper money numbers does seem plausible so long as safety remains constant. Designed with all the right features to give lots of fun in combination with assisting development and comprehension among children for the use of money. A cash register with child sized dimensions and weight along with superb ease of use and offered a good customer friendly investment, this product offers fun and learning combined with a standard purchase price. The teaching on how to spend money, how to total up or deduct money amounts all takes place very naturally during playing. Beginner math will develop the more children play, logical skills are assisted positively and while playing, children gradually figure out different values for different types of money. The built in coin slot reads and identifies both the toy money and real coins. Values for transactions are clearly displayed in large number fonts on the register screen, the scale works to teach children weights and value, a nice designed in scanner for cards and coupons so children can pretend they are shopping on credit. This toy will take children up through four levels of playful shopping which takes a child gradually through taking on board increased levels of math skills. Buttons for ringing up costs are large, robust and easy for children, the scale will show children the importance weight has on costs when we go shopping. The overall size of this product is built to work with small children while introducing the basic functions involved when out shopping. This is a specific learning toy with a good set of learning aims which we all want children to acquire and that this toy can promote learning while bringing children to have fun interacting is certainly a top feature for this product. Worthwhile gift and positive investment for young children.